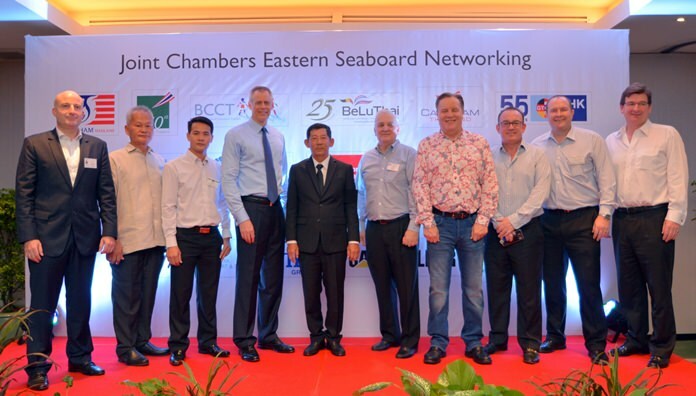 The American Chamber of commerce (AMCHAM) invited the BCCT, AustCham, Belu-Thai, GTCC, NTCC, STCC, Mexican Chamber, Canadian Chamber, Singapore Chamber and SATCC for an Eastern Seaboard Networking organized by AMCHAM. Event sponsors pose on stage for a fun commemorative photo. (L to R) Markus Lorenzini, Somsak Tanruengsri, Pasit Foobunma, Jeffrey Nygฟaard, Mayor Anan Charoenchasri, David Nardone, Simon Matthews, Mark Bowling, Brendan Cunningham, and Nigel Westlake. The networking was held at the “new” Avani. For those with long memories, the property was originally the Royal Garden, then Marriott, and now part of the Avani group. The evening’s organizer was the hard-working Judy Benn, who even managed to get representatives from all the chambers on the stage at the one time! 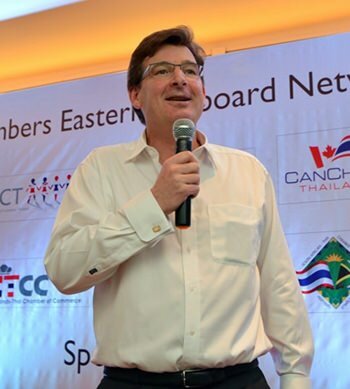 AMCHAM was backed by Hemaraj Land and Development (David Nardone) and Caterpillar. 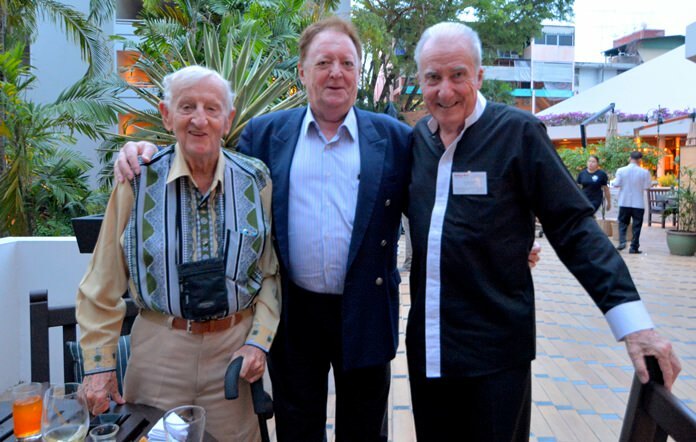 (L to R) Archie Dunlop B.E.M., Allan Riddell, Counselor to the Board of the SATCC, and Dr. Iain Corness. The original venue in the Avani was to be the Sala Rim Nam, but with the threat of rain, Judy wisely selected the indoors venue, though with the number of networkers, they spilled out on to the area overlooking the swimming pool. Many of the usual faces were evident, with the BCCT well represented, including Chairman Simon Matthews and Executive Director Greg Watkins both circulating. Winner of the best business card was Ian Sherratt, one that was legible and stated what field of business he was in. At the other end of the spectrum was Yuthika Kalayanasuko from SEAC presenting a business card with a font so small that it was not possible to read it, let alone fathom what industry she represented. Does nobody look at their business cards critically before wasting money on the card – your representative! 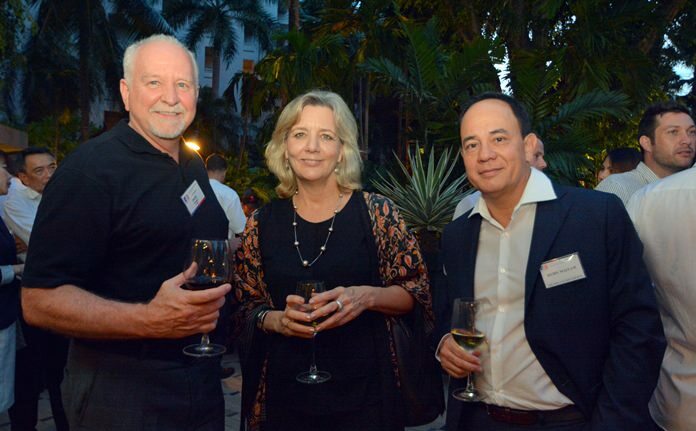 It was a warm welcome back to see David Holden (Director of Sales and Marketing now at the Arnoma Grand in Bangkok) at an Eastern Seaboard function. 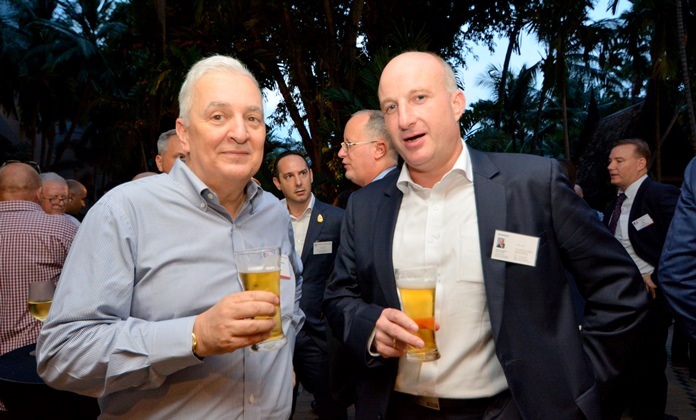 David Nardone, president and CEO of Hemaraj Land, and Markus Lorenzini, President & CEO Siemens Limited Thailand. 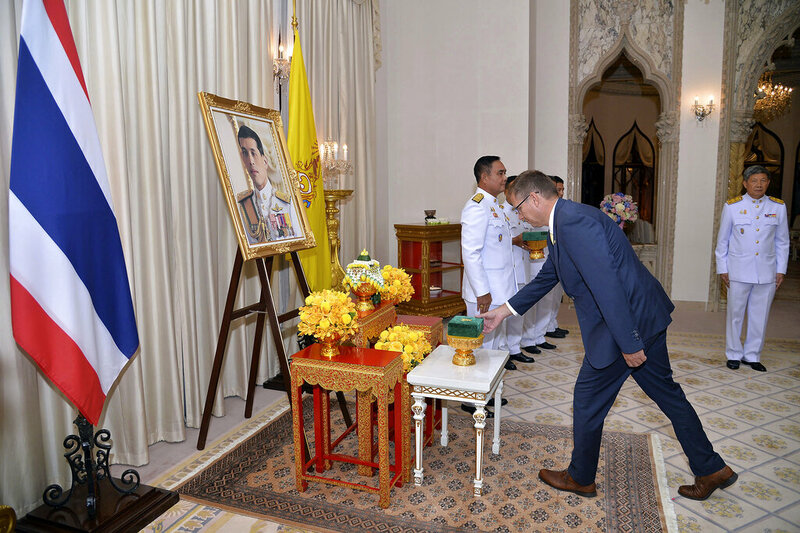 Brightening up the room were the two ‘orange’ ladies from the New Nordic Group, Siripoom (Kwaang) Boon­mamuang and Panida (Ant) Yeo and the Bangkok Hospital Pattaya’s marketing people Tanya and Metas. The networking was well attended, as Eastern Seaboard ones generally are, and it was good to see some new faces amongst the attendants and welcome to the AFG’s Carey Peck (DHL), but a farewell to Mike and Rosanne Diamente returning to the USA (Tucson). Nigel Westlake, Founding Headmaster of Rugby School Thailand addresses the networkers. Mayor Anan Charoenchasri (right) addresses the guests. 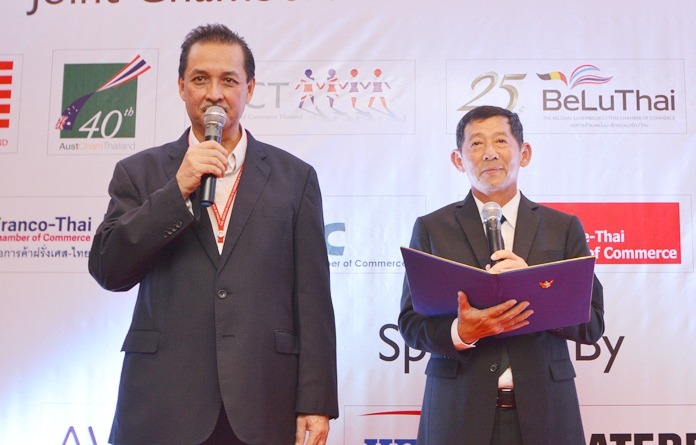 His speech is translated into English by a member of the American Chamber of Commerce Thailand. 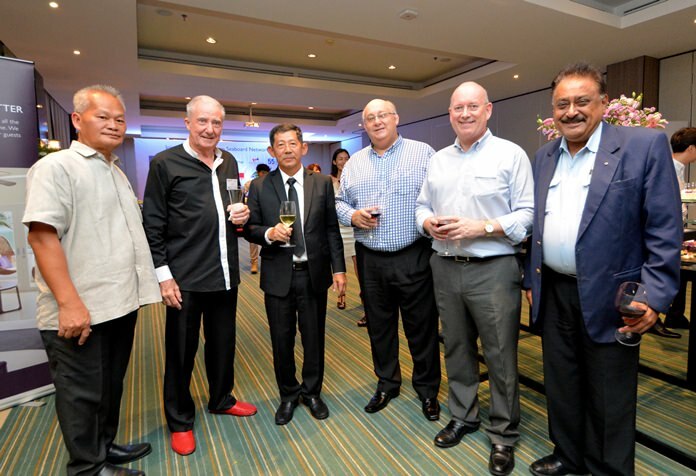 (L to R) Somsak Tanruengsri, GM of Avani Hotel, Dr. Iain Corness, Mayor Anan Charoenchasri, Warren Boyes, President of the New Zealand-Thai Chamber of Commerce, Graham Macdonald, former chairman of the BCCT and SATCC, and Peter Malhotra, Managing Director or Pattaya Mail. Siripoom (Kwaang) Boonmamuang, PR & event manager of New Nordic Group, chats with Wallapha Sawasdikool and Metas Pukmahamad from Bangkok Hospital Pattaya. David Carden from Fedex, Vice President American Chambers Judy Benn, executive director at AmCham, and Remy Maitam, Triumph Aviation Services. 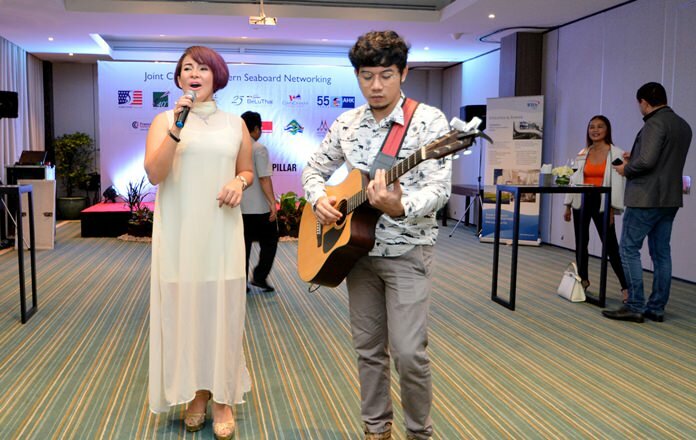 The resident band at the AVANI hotel provided a musical backdrop for the evening. Jesters Gala Party Night is this Saturday!